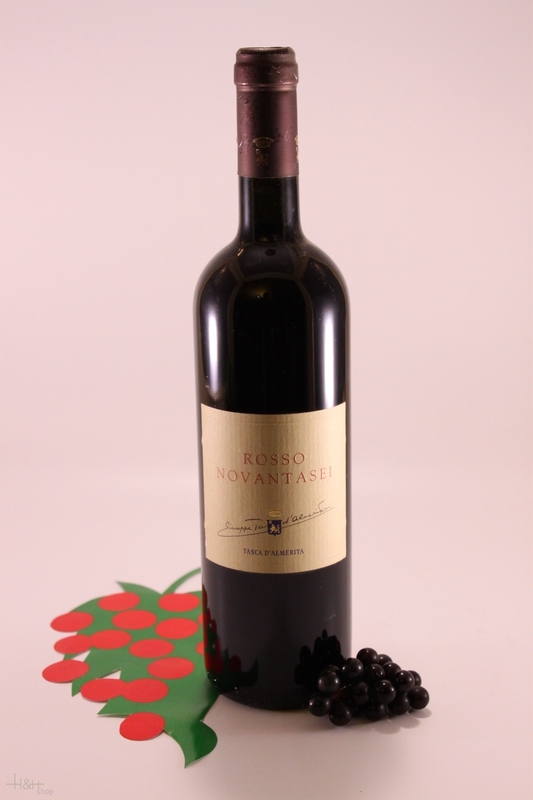 "Jeannie Cho Lee" has rated the wine "Tasca d'Almerita Tenuta Regaleali Nero d'Avola Sicilia, Sicily, Italy" from the vintage 2009 on 16.05.2012 with 80 of 100 points.
" Generous flavours of ripe plums, figs and prunes but with drying tannins and rusticity in the finish. Calls for a juicy steak. Big, generous red for early drinking. Tasted in: Beijing, China. Maturity: Drink. " "Wine & Spirits Magazine" has rated the wine "Tasca d'Almerita Tenuta Regaleali Nero d'Avola Sicilia, Sicily, Italy" from the vintage 2012 on 01.06.2015 with 91 of 100 points. "Wine Spectator" has rated the wine "Tasca d'Almerita Tenuta Regaleali Nero d'Avola Sicilia, Sicily, Italy" from the vintage 2012 on 30.09.2014 with 85 of 100 points. "Wine Spectator" has rated the wine "Tasca d'Almerita Tenuta Regaleali Nero d'Avola Sicilia, Sicily, Italy" from the vintage 2011 on 31.05.2014 with 86 of 100 points. "Wine Enthusiast" has rated the wine "Tasca d'Almerita Tenuta Regaleali Nero d'Avola Sicilia, Sicily, Italy" from the vintage 2012 on 09.01.2014 with 88 of 100 points. "Wine Enthusiast" has rated the wine "Tasca d'Almerita Tenuta Regaleali Nero d'Avola Sicilia, Sicily, Italy" from the vintage 2009 on 04.01.2012 with 87 of 100 points. "Vinous Antonio Galloni" has rated the wine "Tasca d'Almerita Tenuta Regaleali Nero d'Avola Sicilia, Sicily, Italy" from the vintage 2009 on 01.06.2011 with 88 of 100 points. "Wine Enthusiast" has rated the wine "Tasca d'Almerita Tenuta Regaleali Nero d'Avola Sicilia, Sicily, Italy" from the vintage 2007 on 03.01.2011 with 87 of 100 points. "Vinous Antonio Galloni" has rated the wine "Tasca d'Almerita Tenuta Regaleali Nero d'Avola Sicilia, Sicily, Italy" from the vintage 2008 on 01.08.2010 with 88 of 100 points. "Wine Enthusiast" has rated the wine "Tasca d'Almerita Tenuta Regaleali Nero d'Avola Sicilia, Sicily, Italy" from the vintage 2008 on 05.01.2010 with 86 of 100 points. "Wine Spectator" has rated the wine "Tasca d'Almerita Tenuta Regaleali Nero d'Avola Sicilia, Sicily, Italy" from the vintage 2008 on 15.12.2009 with 84 of 100 points. "Wine Spectator" has rated the wine "Tasca d'Almerita Tenuta Regaleali Nero d'Avola Sicilia, Sicily, Italy" from the vintage 2007 on 31.10.2009 with 83 of 100 points. "Vinous Antonio Galloni" has rated the wine "Tasca d'Almerita Tenuta Regaleali Nero d'Avola Sicilia, Sicily, Italy" from the vintage 2007 on 01.08.2009 with 87 of 100 points. "Wine Spectator" has rated the wine "Tasca d'Almerita Tenuta Regaleali Nero d'Avola Sicilia, Sicily, Italy" from the vintage 2006 on 31.08.2008 with 87 of 100 points. "Wine Enthusiast" has rated the wine "Tasca d'Almerita Tenuta Regaleali Nero d'Avola Sicilia, Sicily, Italy" from the vintage 2006 on 11.01.2008 with 84 of 100 points. "Wine Enthusiast" has rated the wine "Tasca d'Almerita Tenuta Regaleali Nero d'Avola Sicilia, Sicily, Italy" from the vintage 2004 on 07.01.2006 with 87 of 100 points. "Wine Enthusiast" has rated the wine "Tasca d'Almerita Tenuta Regaleali Nero d'Avola Sicilia, Sicily, Italy" from the vintage 2003 on 09.01.2005 with 87 of 100 points. "Wine Enthusiast" has rated the wine "Tasca d'Almerita Tenuta Regaleali Nero d'Avola Sicilia, Sicily, Italy" from the vintage 2002 on 02.01.2005 with 88 of 100 points. "Wine Spectator" has rated the wine "Tasca d'Almerita Tenuta Regaleali Nero d'Avola Sicilia, Sicily, Italy" from the vintage 2002 on 31.12.2004 with 86 of 100 points. "Wine Spectator" has rated the wine "Tasca d'Almerita Tenuta Regaleali Nero d'Avola Sicilia, Sicily, Italy" from the vintage 2001 on 31.05.2003 with 86 of 100 points. "Wine Enthusiast" has rated the wine "Tasca d'Almerita Tenuta Regaleali Nero d'Avola Sicilia, Sicily, Italy" from the vintage 2001 on 10.01.2003 with 84 of 100 points. "Wine & Spirits Magazine" has rated the wine "Tasca d'Almerita Tenuta Regaleali Nero d'Avola Sicilia, Sicily, Italy" from the vintage 1999 on 01.06.2001 with 86 of 100 points. "Wine Spectator" has rated the wine "Tasca d'Almerita Tenuta Regaleali Nero d'Avola Sicilia, Sicily, Italy" from the vintage 1997 on 31.05.2000 with 81 of 100 points. "Wine Enthusiast" has rated the wine "Tasca d'Almerita Tenuta Regaleali Nero d'Avola Sicilia, Sicily, Italy" from the vintage 1997 with 90 of 100 points. ready for shipment: in stock Bovine handle - Bresaola Steiner approx. 400 gr.